Korea’s state-of-the-art airport facilities have been the backbone of its trade-oriented economy over the years, making it easier for exporters and importers to move goods and raw materials across the border in a more cost-effective and efficient manner. Incheon International Airport, Gimpo International Airport and other airports across the country have encouraged more Koreans to head overseas for educational, leisure and other purposes, while attracting a growing number of inbound foreign tourists, which has led to the globalization of Korea. They have also provided a much-needed boost to the nation’s two flagship carriers, Korean Air and Asiana Airlines, helping them emerge as internationally-competitive firms. Korea’s two airport operators, Incheon International Airport Corp. (IIAC) and Korea Airport Corp. (KAC), have begun exporting their managerial know-how and high-tech aviation equipment to developing countries, creating a new source of income. The nation’s main gateway to the outside world, which opened in March 2001, has become the world’s most competitive and efficiently-operated airport, outrivaling Singapore Changi International Airport and Hong Kong International Airport. Incheon International Airport has been named the world’s best airport for the sixth straight year in the latest service quality survey taken by a global airport consultation group. According to the Airports Council International (ACI), which carries out a survey on consumer satisfaction and service quality for major airports every year, it was rated as the best airport among 1,700 around the world. Incheon airport also claimed the best award among “mid-to large-range” airports and the best award among competitors in the Asia-Pacific region. "With strong support from the government, Incheon International Airport has become an air-transport hub in Northeast Asia. Every single member of IIAC along with employees of our business partners have made it possible for the airport to be named the world’s best for six consecutive years," IIAC CEO Lee Chae-wook said. He then said IIAC will continue to make every effort to improve passenger accessibility by strengthening transportation systems and expanding international routes among other measures in order to remain as the world’s best. Additionally, the airport achieved its best performance in 2010, operating over 210,000 flights, and transporting 33 million passengers and 2.7 million tons of cargo. More than 5.2 million transfer passengers, mostly from China and Japan, traveled via the airport. Boosted by the best-ever performance, IIAC’s revenues reached 1.3 trillion won, generating 30 billion won in net profits. "This year marks the 10th anniversary of the airport. We will double our efforts to realize our goal of becoming a global airport specialist. IIAC will also accelerate its participation in overseas airport projects and Air City development in order to secure a growth engine for the future while implementing an environment-friendly airport operation system that fits the new paradigm of green growth," CEO Lee said. Based on the strong brand power of the airport, IIAC has been active in overseas business areas that used to be dominated by advanced countries. It has been exporting airport operational know-how and advanced technology to foreign countries, including Iraq, Russia, the Philippines, Nepal, and Cambodia. On Feb. 17, IIAC signed a business agreement with Hainan Airport Group, which owns and operates 14 airports across China, to set up a joint venture capitalized at 5.1 billion won. Through the joint company, IIAC plans to transfer airport operation skills to Chinese airports, as well as educate their air-traffic controllers and offer other consulting services. Gimpo International Airport, the largest among 14 airports operated by the Korea Airport Corp., has been serving as another main air transport hub, linking Seoul with cities in Japan and China. On top of operating domestic flights between Seoul and other local cities across the country, the airport manages daily flights linking Seoul with Tokyo, Osaka, Nagoya and Shanghai. These are the busiest routes as tens of thousands of Koreans visit the two neighboring countries every year. Additionally, a growing number of Chinese and Japanese travelers have come here for shopping and other leisure services over the past few years. In the latest ACI survey, Gimpo Airport was named the best airport among mid-range airports, while ranking sixth in overall service quality. "Gimpo was included in the ACI service-quality survey for the first time this year. We were able to achieve such remarkable results because our employees and partners have made an all-out effort over the years to more efficiently operate the airport and improve customer service," KAC CEO Sung Si-chul said. Over 47 million passengers traveled through its 14 airports last year, up from 41.7 million won in 2009. KAC earned 485.3 billion won, up from 433.7 billion won a year earlier, with its net profits jumping to 57.6 billion won from 42.6 billion won. "We expect our bottom line to continue to improve down the road on the back of a soaring number of both domestic and foreign air travelers. 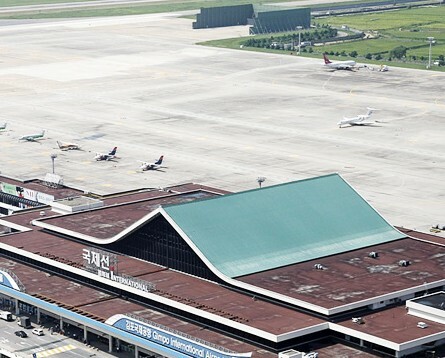 We plan to nurture Gimpo Airport as an aviation hub for short-distance international routes, differentiating it from Incheon International Airport," Sung said. To do so, we will lower airport user fees for airlines, as well as improve airport facilities, aviation safety and customer satisfaction, the CEO said. "We will also make more efforts to operate local airports grappling with chronic deficits. 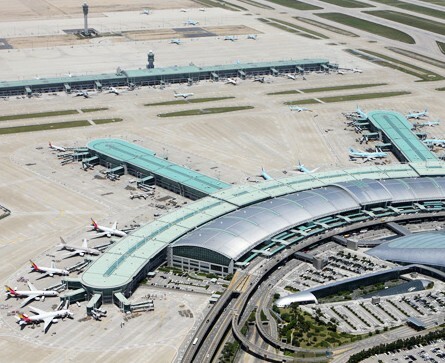 As part of plans to enhance their management, we have decided to sell the managerial rights of Cheongju International Airport to a private entity," he said. Additionally, KAC has been investing heavily in aviation information technology (IT), developing its own products such as flight information system (FIS) and radio frequency identification (RFID). It has also been helping airports in developing countries manage flights and other operations in a more efficient and cost-effective manner. "With the know-how gained from 28-years of airport management and operation, we have been providing consulting services to airports in the Philippines, Columbia and other developing nations. We will launch a more aggressive marketing campaign to expand our reach to other countries," Sung said. KAC has also invited and trained air-traffic controllers. In a bid to attract more foreign travelers and better serve their needs, KAC will open a multi-million dollar leisure and shopping center, called Sky City, at Gimpo Airport by the end of the year. It will have everything to appeal to any leisure traveler’s needs, ranging from a hotel, shopping mall, hospital and even a theme park. "We have also recently decided to build a 27-hole public golf course on land surrounding the airport. Sky City and other leisure facilities will definitely help us draw more non-Korean tourists and encourage them to spend more money here," the CEO stressed.